The item Green Hornet, (electronic resource) represents a specific, individual, material embodiment of a distinct intellectual or artistic creation found in Austin Public Library. In this daring reimagining by trailblazing filmmaker Kevin Smith, young Britt Reid Jr. takes to the streets of Century City as the new Green Hornet, following in the footsteps of his fallen father! But the deadly killer known as the Black Hornet has plans that not only threaten to kill our hero, but spell doom for the whole world, as well. 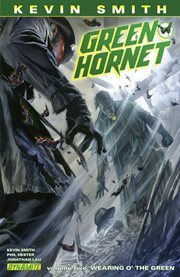 Will even the crime-fighting prowess and martial arts skill of his new female sidekick be enough to end the threat and restore the legacy of the original Green Hornet and Kato? It's high-octane action, drama, and humor, as only Kevin Smith could deliver!